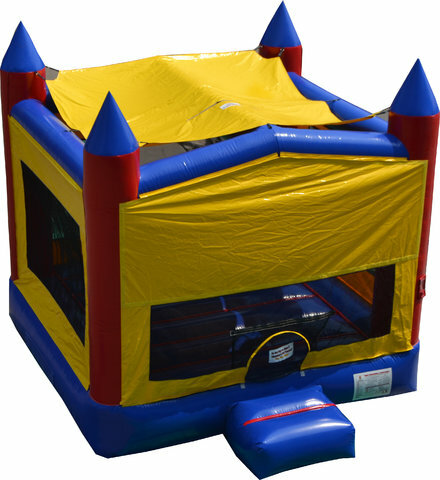 Check out the Multi Theme Castle Bounce House, a giant party inflatable that dons an exciting castle design, with towers and all! This bounce house features a classic red, blue, and yellow color scheme, and is compatible with a variety of different banners to better fit the theme of your party or event! Other standard features include large mesh windows on all sides and a safety step at the entrance of the castle bounce! Standing over 13’ tall, the Multi Theme Castle Bounce House is sure to thrill guests of all ages at your upcoming celebration. Reserve yours today! Minimum Participant's Height - 34"
Maximum Jumper Weight - 180 lbs.